The PlayStation 4 may be the most popular games console of this generation with over 60 million systems sold since launch, but in Japan the Switch is currently outperforming it by some margin. According to 2ch (via Kotaku), the Switch has sold almost three times as many systems as the PS4 in the first 26 weeks of sale. 665,760 PS4 units were sold in the first 26 weeks on sale in Japan - nothing to be sniffed at. However, Switch has now shifted 1,527,962 units in the same time frame; it took the PS4 Sony 69 weeks to reach 1,523,471 units. All of these figures are taken from the highly respected Japanese retail tracker MediaCreate. Of course, Japan is not the world, and the while the Switch continues to sell briskly elsewhere, the PS4 remains dominant. Still, given that Nintendo's console isn't even a year old yet, such data bodes well for the future of the platform. Thanks to Savlep99 for the tip! No surprise, they love thier mobile game devices over there. I was reading this, I also read that it's miles behind where Wii was at the same time in its lifetime. Edit: I've been looking but can't find the article stating how much the Wii had sold after 6 months. Maybe someone else can find it or remember the number. Now imagine if Nintendo actually had enough consoles in stock too! This will promote more Japan "exclusives". Maybe worth learning some Japanese? @SLIGEACH_EIRE What do you mean by that, exactly? @SLIGEACH_EIRE The Wii was also a phenomenon. It's popularity wasn't ordinary. The Switch is just a really popular console and hey, that's pretty good. @SLIGEACH_EIRE The Wii was a complete anomaly, a one-off the likes of which we'll never see again. Best to compare to current formats, rather than formats from 10 years ago when the industry was almost totally different. @SLIGEACH_EIRE The Wii had its Xmas shopping season by that point in its life.The Switch is obviously still to get that,it's fair to say sales are going to see a massive spike then.It'll be interesting to see how it compares to Wii after 9-12 months on the market. At the end of June,2007 after just over 7 months on the market Wii had sold 9.27m worldwide.Switch must be at around 6 million by now after only 6 months and a March launch.It's not really too far behind. @AlternateButtons It's a popular handheld. And Nintendo handhelds sell well, especially in Japan. @OorWullie Exactly, comparing Switch to consoles that launched not only a decade ago, but in the Holiday season is a little...stupid? Besides, I take the @rjejr approach and argue that it's not a console or a handheld, so there are no current apples to apples comparisons. And yes, if one were to compare the sales of both Switch and Wii, it would be smarter to compare them after about a year on the market. @SLIGEACH_EIRE Exactly. Handhelds will always do well in Japan. And the Wii was a one-time stroke of gold, not gonna happen again. If you disclude the Wii, then Nintendo has been going downhill ever since the N64. The Switch brought the chart up. Glad to see it's doing well. This just confirms that Nintendo is a joke and they should go third party? @Damo if you want to be really pedantic, you can't compare the Switch to the PS4 as the 6th generation cycle would be Ps4/Wii U/ Xbox One. @jswhitfield8 Alternative headline: "Switch currently dominating the unreleased PS5 and Xbox 2 in sales"
@IronMan28 If Nintendo can keep the pace of releasing a big game every month throughout next year and with (hopefully) no stock issues then I really don't see why sales should slow down.I'm not sure they can top this years big 2 but I bet they have something big planned that we've yet to find out about.Ninendo have never had a release schedule like that before so even that makes it hard to predict how it'll go.Plus a proper Pokemon in HD and on the TV for the first time.If that does come out next year then I think it's fair to say the Switch won't be too far behind the 20.3m the Wii had sold by the end of 2007. @Dakt the math is strong with this one. The ps4 sales all came in the following years which will be where the switch has slowed to a crawl. @IronMan28 It's too early in the morning for the maths. Of course software sells hardware, Switch launched w/ Zelda, then MK8 and Spaltoon 2 shortly thereafter. I don't recall exactly what PS4 launched with in Japan but whatever it was it was probably also on PS3. PS3 got shafted in the West for some games that released on it in Japan. I don't think there were many exclusive games for a PS4 purchase. Unlike Wii U which has beene all but dead since Zelda, PS3 got most PS4 games for at least 2 years, at least in Japan. Zelda is also on Wii U, but Spaltoon 2 is the big seller. I'm not sure there was a Splatoon type game on PS4 until DQ11. Maybe FFXV. PS4 is a western home console, Switch is a Japanese portable. Done. @Damo Hhahahaha now that's a good headline. Not surprising it's off to a better start than PS4 which is a very Western-focused console. I'm happy about the success of the Switch, particularly in the Japanese market. At a certain point, Japanese third parties are going to have no choice but to hop on board. I'm not the biggest fan of traditional, turn-based JRPGs but I do hope to start seeing games like the Tales of series, NieR and other other action-RPGs to start hitting the system. It'd also be nice to get Namco on board with stuff like Tekken, or hell, even a Ridge Racer revival. Geez and DQ isnt even out yet. I swear when they catch up with demand the sales numbers will be insane. Good news! I would hope it would quiet the naysayers, but that's just wishful thinking. @Dakt Yeah, apparently 2.295 is almost 3. You learn something new every day. Comparing Switch sales to Wii sales is not really appropriate. Wii was a holiday launch, wasn't nearly as supply constrained as there was no component shortage, and launched 10+ years ago. A lot has happened in 10 years. Wii sales in Japan also peaked in 2007 (Year 1) and declined from then onward. At one point, the Wii was outpacing every other Nintendo system in sales in Japan outside of the GBA, including the DS and 3DS. With Pokemon, Animal Crossing, Smash Bros, Monster Hunter, and Yokai Watch all presumably on their way to the Switch in the future, Switch sales will not peak in 2017. In Japan, the Switch sold 240,000+ units per month in July and August. LTD sales are now at ~1.53 million. If the Switch continues to sell 240,000+ units per month from September to December, it will reach 2.5 million units sold by the year's end. Of course, that assumes there is no holiday sales boost, so in reality, the Switch sales should end up sitting at 3.5 - 4 million units sold by the end of the year. @GrailUK Doomed really. Anyone piped in with 'this is why Nintendo is in last place" or "the Japanese market means nothing" yet? Great stuff. More Japanese support please. @rjejr I should clarify that I'm talking about the Switch in comparison to Wii. Wii and Switch aren't comparable because of the conditions outlined in my reply to Oorwhatshis/hername. @jswhitfield8 If you really want to be pedantic, the Xbox One, PS4 and Wii U (& Switch) are the 8th gen of consoles. People keep going on about Christmas. News flash people, Japan isn't the West and they don't care about Christmas like we do. Switch sales have incorporated several holidays, including Golden Week. @westman98 You don't know what you're talking about, no offence intended. You're in good company on this site. The Wii was severely supply constrained. It didn't spend any time sitting on the shelf in its first year. @OorWullie Those numbers are obtainable. The Switch is facing a component shortage, while the Wii didn't. But both were quite supply constrained. In the end, the Wii should see much higher first year sales than the Switch due to larger shipments, a more unique gimmick (at the time), a greater focus toward casual/non-gamers, and the lack of a booming mobile games market in 2006/2007. "News flash people, Japan isn't the West and they don't care about Christmas like we do." Have you ever looked at Japanese sales data during Christmas?? Video games sell much, much better during the holiday season in Japan. 40-45% of all Japanese hardware and software sales come from November and December alone in any given year, much like for the rest of the world. Japan may not care about Christmas, but they sure as hell care about shopping a lot during the holidays. @IronMan28 Wii isn't really comparable to anything. Though I disagree w/ damo about using generations as a reason. I don't know why Wii sold so well in Japan - price must have been an issue though , half price of PS3 I believe - but Wii Sports sold in the West. And besides, PS2 outsold everything but DS and GB in Japan, so there was a time home consoles sold. The Vita crushed Wii U in Japan, 5m > 3m, and we all know Vita was an overall disaster on the scale of Wii U. Sony may even be out of the handheld market entirely b/c of it. Though I still expect a PSP3 w/ mini-HDMI out. They'll dump the Vita name, VitaTV did it in, but the Japanese market is too handheld focused for them to drop it entirely I think. Maybe a PS4P. Something. "Next, let’s take a look at how a few key titles performed during this important holiday week. Pokémon Sun and Moon did extremely well, with 322 830 units sold at retail (+71%)." "Super Mario Maker for Nintendo 3DS truly has been the surprise of the 2016 holiday season, and a tremendous success for Nintendo. This week, it sold 315 382 units: sales basically doubled (+109%) from Week 50." "As for Miitopia, it was off to a rather mild debut, but sales remained quite strong during the following weeks. During Week 51, they basically doubled (+107%), with 50 299 units sold." 20./19. [WIU] Splatoon (Nintendo) – 15.356 / 1.463.148 <80-100%> (+114%). It’s getting closer and closer to the 1.5 million units mark;"
@rjejr Wait. Do you think Sony is STILL not out? @SLIGEACH_EIRE Indeed, Christmas is not as important as in the west, but it is a (meaning "THE") shopping season in Japan. Golden Week isn't. So Christmas does have great impact on sales. I have been saying for quite some time now, that it is just a matter of time till we get lots of third Japanese party support. By this news it seems it will be earlier rather than later. @maruse @SLIGEACH_EIRE Japan may not be the west, but that doesn't mean they don't have similar shopping trends. 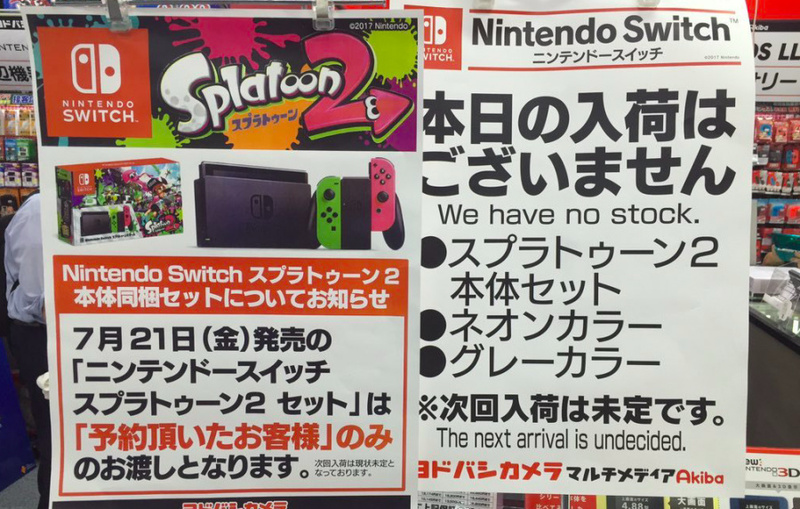 There have always been huge end of years sales which Japanese console launches have traditionally taken advantage of & Japan's equivalent of Black Friday... is on Christmas. Yes the Switch has taken advantage of holidays other than the Winter sales in Japan, but if anything shopping/sales are even MORE stacked into the end of the year than in the West. Awesome. I'm not surprised, the PS4 had a slow-ish start and the Switch is already looking to have one of the better first years for a video game platform in a long time. @MsgBoardGamer Yes, I know sales go up at Christmas in Japan, but unlike in the West it's not the be all and end all with regards to sales. They've other times of year where sales spike. @OorWullie Pokemon is a mega seller. It's the second best selling franchise in the world (only second to Mario) and this only includes the games themselves. No matter what it is: print Pikachu on it, it's going to sell. Pokemon is a money printing machiene. A mainline Pokemon on Switch will probably have an impact we can't even imagine, because we never had it before, but everyone's been asking for it for over 20 years. Nintendo has a lot of hot games comming to Switch, but Pokemon Switch could become a game changer. This is a good news. Popularity in Japan means more Japanese games, and more Japanese games means more Jrpgs and turn based strategy games. And Switch popularity in States is enough for localising many of those games. @Dakt that why it says nearly? Maybe? @NinNin Out of the handheld business? No, I don't think so. How can they be, pretty soon all there will be is handheld business. Once phones get powerful enough to run VR headsets we wont' need home consoles or TVs. And the smart TVs we do have will stream games, we won't need consoles. So for right now, a Vita 2 is dead in the water, but they just can't get out, handhelds are too big in Japan. I think a PS5 could be very Switch like. Though the dock would be half the consoles power to do 4k on TV, the handheld would do 1080p or 720p. Or they could make PS5 what many of us thought NX would be, a home and handheld that play the same games. Or they could just make a tablet - which is really all the Switch is after all - that can play PS5 games w/ a bluetooth controller like the Nvidia Shield. So no Vita 2, but abandoning handheld gamers in Japan just won't work, they'll need something. Maybe even just a $100 streaming PS5 controller w/ a screen where the touchpad is. Or a portable pocket size PS4 that can run PSVR. Though you'd need a 20 pound backpack of a battery for that. Let's be realistic here. The switch is half the price of the ps4 when it launched in Japan. You start getting into supply, demand, cost, etc. So yes the switch will move more units just based on cost alone. The ps4 had far greater issue with supply due to manufacturing and cost of that manufacturing. So this really isn't a fair comparison and doesn't really say a whole lot other than Japan likes things at a lower price point and if enough of a supply is available along with a well rated game it'll sell. I'm more concerned with 2018. While the switch has two great titles on the horizon, the system is still catering to a smaller demographic. Its hoping its portable market dominance sways 3ds and vita owners to help continue its relevance. @rjejr If the PS5 is like the Switch, it will have 32-64 GB of internal storage, which means if you have 30 PS4 games, you may only be able to install one of them. Also, it won't have a Blu-ray player. I don't think Sony will ever do that. @NinNin Well Sony already doesn't have a 4k blu ray player in the PS4 Pro, while Xbox 1 S does, so Sony doesn't need to be cutting edge all the time. Also, Sony has it's own 4k streaming service on it's TVs, ULTRA, so I think they know which way the industry is heading, streaming, not discs. So PS5 as a handheld not having a blu ray player isn't impossible to imagine. And if it doesn't have a blu ray player then it doesn't need a disc player at all, lowering the price of hardware. Have you seem how big the Switch dock is? It's practically as big as some DVD players, so it isn't hard to imagine a Switch like PS5 were the dock has a 500GB HDD and a blu ray player. Is Sony makes that dock optional for TV out so much the better. Portable storage is a factor, FFXV is currently 71GB on my PS4 HDD, but SD cards are getting cheaper, which means internal storage is getting cheaper. Also, if Sony were to sell a PS5 Home or dock and a PS5 Portable that play the same games, they could argue the portable only needs a few games at a time. 128GB would give them that at not a horrible price as SD cards that size go for under $50 retail, really not much more than the 500GB drives in the PS4. 128 is still small, but it isn't nearly as small as 32. There are always work arounds to every problem, and right now Sony is in the drivers seat for videogame companies. Xbox isn't selling that well, and Nintendo can't make enough Switch. So while I don't think the PS5 will be only a handheld like Switch w/ limited abilities - PS5 will have Netflix and HBO - I also don't think Sony will entirely give up on the handheld market in Japan. Nintendo is on to something w/ Switch, Sony will find a way to copy that something.